Renner Springs Desert Inn offers a range of affordable accommodation * Motel rooms * Grassed Caravan and Camping Area * Restaurant * Historic Bar An real roadside Pub with plenty of history and atmosphere. 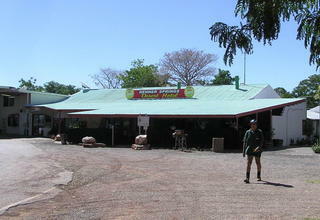 A road-side stop on the Stuart Highway between Darwin and Tennant Creek. 150 kilometres north of Tennant Creek in the heart of the Barkly Tableland. Named after Dr Renner who discovered the springs during the labouring work of the Overland Telegraph project after spotting a flock of birds. Just the Hotel Motel in town. A major refuelling shop.